"In life, the nature of a relationship is known only to two people: those at either end of it. All else is idle speculation, however much you and I may pride ourselves on our unerring perception and judgement of the feelings of others. The novelist is another matter; he or she really is omniscient. The relationship now is three-sided; there are the participants and there is also this god-like figure who knows it in its entirety, knows it indeed even better than those involved, who can slip from one skin to the other." Written by Lively's character, Gilbert Strong in "According to Mark." 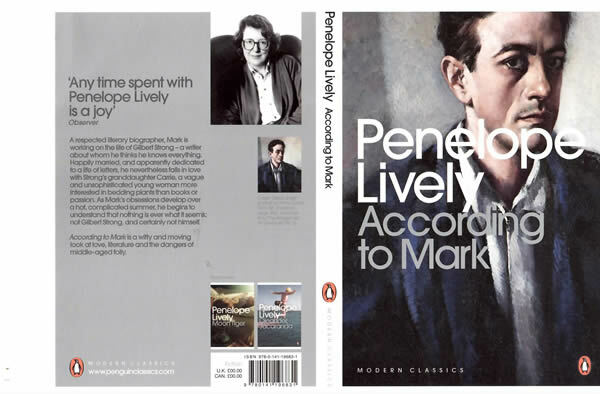 "He was very much his own man, gregarious but essentially very private, even solitary. Perhaps this accounts for the peculiarly diverse pictures of him from friends and aquaintances. (Strong wrote...) 'After all, we lie about one another with as much alacrity as we lie about ourselves - lies not of malice but of incompetence. We look at each other square - head on - we seldom trouble to walk around behind and take another view.' 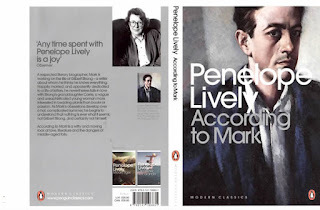 "
Lively's Mark (a biographer), speaking to a radio producer about Strong. I just finished reading According to Mark, puzzling my way through it, knowing immediately this was wonderful writing; highlighting things I couldn't let go of -- and wondering where I was being taken. This, like so much of Lively's work, delves into the concepts of reality vs. perception; that is, developing the idea that the memory can be powerful, but also terribly flawed ... that memories have a strong impact on our lives - not only on those of us who are groping through them in order to make some kind of "whole cloth" for ourselves - and of ourselves; but how our memories collide with and influence those around us. This novel looks at how the past of even the most ordinary person can have a big impact upon the present; how the tensions between personal histories and so-called "official versions" can be destructive; but also, at times, when open to acceptance of impurities, can be very healing. Much of my own fiction writing is an exploration of the past. And while writing my characters, I get to control them - and their memories - all restrained by the number of pages that make up a novel, which means I am only putting in what I deem important, knowing, as Lively's character Strong also writes, "The characters, presumably, have a whole other life, off the pages of the book." My own personal memories feel true, but are they? I am sure there are some who think they are often skewed and I have much less control over that. We all know how this feels, dealing with siblings and other family members with different memories of the same events and the same people in those events. Perhaps my own memories of a difficult, confusing, yet at times happy and at times lonely childhood is one of the reasons I write about past lives. My desire to write about the past, also comes from being a family history researcher and, sadly, involves slaying myths that so many people have built up through "memories" about their families, often from older family members. I've come to realize that some people hang on to those myths with amazing resiliancy and at times fierce tenacity, despite primary documents from censuses, ships passenger lists, church records of marriages, births and deaths, and other historical facts in "black and white". Sometimes these myths are held close, I think, to allow the person to live in/through other memories not their own, but "memories" that somehow impact in a very vital way on how they see themselves. The past and our perceptions of it make for a dense, complex and interesting source for writers - and Lively uses it "for all its worth!" I have not read Badami's book. But I'll definitely look it up!